SPIERENBURG P & VAN DER SPEK V (2018) Waves of Goldcrests Regulus regulus: an analysis of the 2015 influx. LIMOSA 91 (3): 97-107. In the Netherlands, the number of migrating Goldcrests in autumn fluctuates strongly between years. Influx years were 1972, 1973, 1975, 1983, 1989 and 2008. In autumn 2015, there was another massive influx with a record number of birds ringed at Meijendel, province of Zuid-Holland, which allowed for a thorough analysis. As described in previous studies, Goldcrests arrive in clearly separated waves. The Goldcrests caught in 2015 followed the southwestern route from Scandinavia to the Netherlands. In contrast to earlier influxes there was no indication of arrivals from the East / the Southern Baltic coast. In October, three clear waves were distinguished. These lasted 7-10 days each, with peak numbers in the first 3-4 days. The vast majority were first calendar-year birds (90%, 97% and 92% for the three consecutive waves). The turnover was high, as suggested by the low number of recaptures at the site (1.2%) with an average time between consecutive captures of 2.0 days. 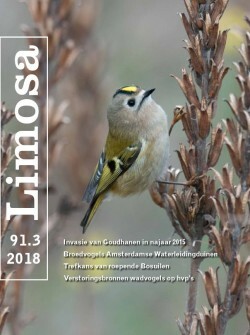 In previous studies, Goldcrest influxes were linked to specific conditions: a good breeding season in Northern Scandinavia and Northern Russia and favorable weather conditions to leave the breeding grounds, combined with air systems that push the birds into the direction of the Netherlands. All three waves in 2015 correlated with such weather conditions in the Northeast. There were no clues that the separate waves originated from different geographical areas. Based on the weight/wing length ratio, the condition of the birds increased during the season, especially in females. Within waves, in both males and females, birds with longer wings arrived earlier than birds with shorter wings. Females that arrived later within a wave were in a better condition than those that arrived earlier. The condition of the birds suggests that there are likely two migration strategies: 1) arrive early, but without any reserves (especially males), or 2) arrive later, but in a better condition (especially females).